In recognition of Veterans Day 2018, Massachusetts Building Trades unions and union contractors honored the contributions of local veterans and raised more than $50,000 for the career pathways program, Helmets to Hardhats. This life-changing program provides a crucial career pipeline into the union constructions trades for the Commonwealth’s bravest. Helmets to Hardhats is a national nonprofit that connects National Guard, Reserve and transitioning active-duty military members with meaningful, family-sustaining careers in the union building trades. The Massachusetts Building Trades Council is a longtime supporter of the program, which has placed more than 575 military veterans in union construction jobs statewide. Hundreds of returning vets and their families benefit from family-sustaining, middle-class careers through the union building trades. “We are so proud to support Helmets to Hardhats in providing career opportunities for our valued veterans. 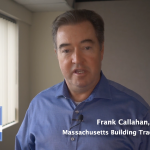 With these donations, we want to thank these courageous men and women for their service and send a clear message that there is a place for them with our unions,” said Frank Callahan, President of the Massachusetts Building Trades Council. The Massachusetts building trades unions represent the largest workforce in the state, and are focused on creating middle-class employment opportunities for families across the Commonwealth, including for returning veterans. Helmets to Hardhats Executive Director Darrell Roberts recognized the generosity of the building trades unions and union contractors. “Thanks to the generous contributions of the Massachusetts building trades unions and union contractors, we’re able to ensure that our returning veterans have meaningful, well-paying careers in the union building trades. Their support has allowed us to do even more to support the Commonwealth’s bravest,” said Darrell Roberts, Executive Director of Helmets to Hardhats. Find out more about Helmets to Hardhats here.